As we all know that Google Plus is currently under beta phase, and Google Plus team are doing their best to bring best social networking site. But if for some reason you do not like Google Plus service and want to disable / delete your Google Plus account, here is how you can do. Click your name and then go to Account Settings. Under Services click “Delete profile and remove associated social features”. 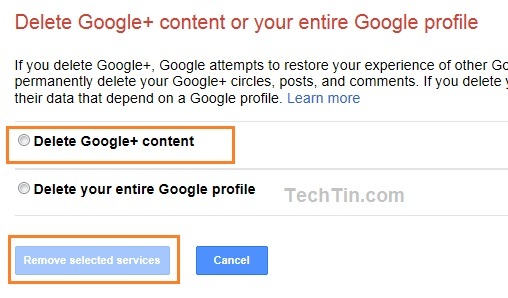 Select “Delete Google+ content” and click “Remove Selected Services” button. This will delete your Google Plus account. Please be careful when deleting your Google Plus account and read the instructions carefully. It was a nice article . I too feel that google plus users surly need a guide to how to delete it safely .